Currently we are going through a rare London heatwave in April. My manager even bought me my first ice cream of the year today. Dark Chocolate with Caramel – in case you are interested. Still I could not resist sharing this hazelnut-crusted lamb recipe with you. I love cooking and baking with hazelnut, mainly because I have this very annoying allergy, that causes my face to swell up when I eat raw hazelnuts. Ground hazelnuts are not that common in UK supermarkets; but you will find them in German supermarkets quite easily. Thankfully those two flavours go beautifully together. 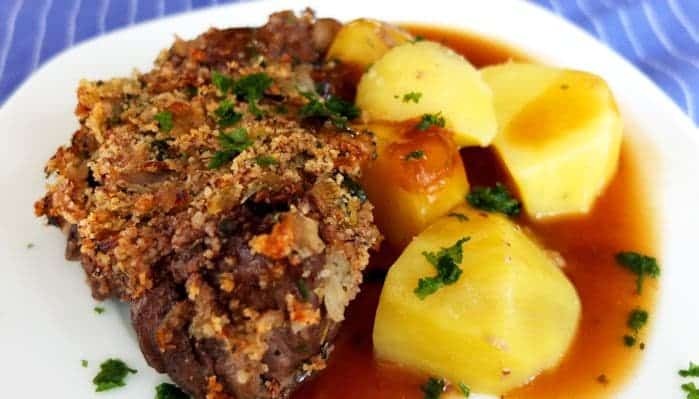 I love the combination of the juiciness and tenderness that you get from a good lamb fillet, and the crunchy, nutty – almost sweet flavour of the hazelnut. Combining this lamb dish with a sherry – balsamic sauce made this dish even more interesting. Eating this lamb was almost like a journey itself, trying to distinguish the different flavours from another; while allowing the combined tastes to unfold in your mouth. Although this dish is quite simple to prepare it felt like a labyrinth of flavours once I put it in my mouth. We served this dish on Easter Sunday and it was a hit. It went well with some green beans and boiled salted potatoes. Heat 20 g of butter and 2 table spoons of olive oil in a large pan and fry the onions on a medium heat until golden brown. Add the thyme leaves and cook for a couple of minutes. Remove the onions and set aside in a bowl to cool. Add the remaining butter, breadcrumbs, hazelnuts and parsley and mix well. Season with salt and pepper. Season the lamb filets with salt and pepper. Heat the remaining olive oil in a pan and fry the meat on a high heat from all sides to seal it. Place the meat in a flat oven proof dish. Spread the hazelnut mixture on top. Place the lamb in a preheated oven for about 210 degrees Celsius. Bake for about 20 minutes until golden brown. While the lamb is in the oven add the Balsamico and Sherry into a saucepan and bring to boil. Add the chickenstock and boil for 2 minutes. Now mix in the 2 table spoons of corn flour with a whisk. You can add more corn flour if you prefer a thicker consistency. Season with salt and pepper. Before serving drizzle the sauce over the lamb. Serve with potatoes and green vegetables.